There's a lovely article in the City section of the New York Times today about the memorial service and festival to honor legendary swing dancer Frankie Manning entitled "Honoring the Man Who Helped Make Lindy Hop." It's got lots of great quotes from friends and fans of Frankie from the memorial, and a couple of nice pics, including one of me leading the Second Line processional from the church to Central Park. That's David Ostwald's really swinging Gully Low Jazz Band behind me. It was a great honor getting to lead the processional. 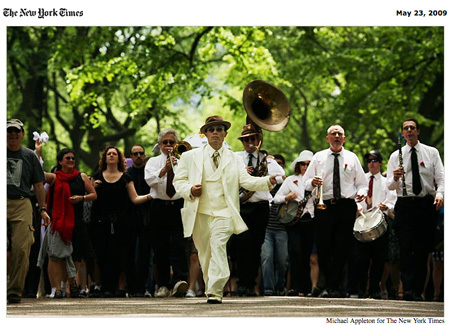 And so amazing seeing the crowds that formed as we slowly made our way up Fifth Avenue, and then into the park, ending up at the Naumberg Bandshell, where hundreds more lindy hoppers awaited us. It was a glorious celebration of Frankie, a couple thousand of us swinging in the spring sunshine. Rik, You look fantastic and totally deserve this photo! You have to contact the Times to get a copy. God bless you for virtually bringing Frankie 95 to those of us who couldn’t be there. Great capture by the photographer. You truly make the photo. Thank you for taking the time to share all your imkpressions with us.